Researchers have found that consumer plastic waste makes up 38% of freshwater litter. That our rivers and oceans are choked with plastic is well-documented. But where is all this waste coming from? Based on analysis of almost 200,000 objects found in rivers across Europe, including France, Poland, Switzerland and the UK, researchers from the Earthwatch Institute and Plastic Oceans found that consumer plastic waste makes up 38% of freshwater litter. 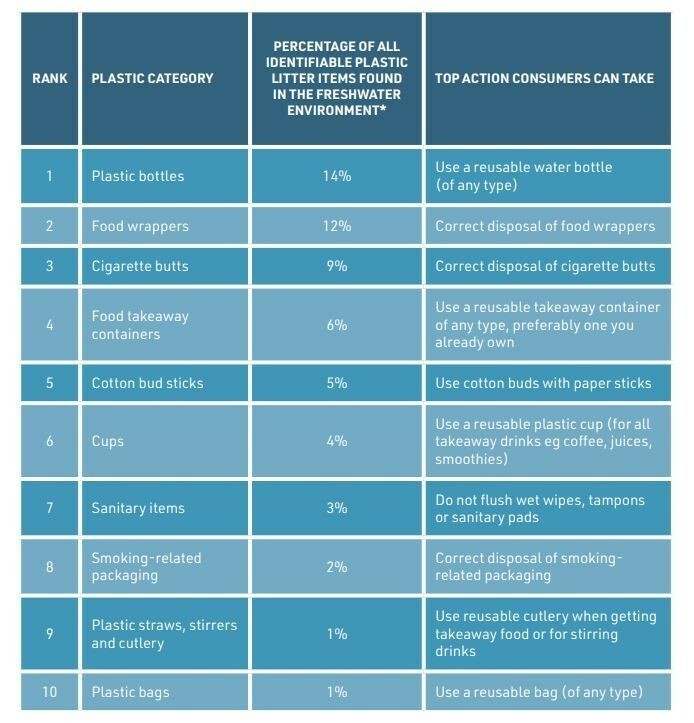 Plastic bottles accounted for almost a sixth of all items found, followed closely by food wrappings which made up an eighth of the waterborne rubbish. Next came cigarette butts and takeaway food containers. In a joint report titled Plastic Rivers, the researchers say that, in the UK alone, the average person uses 150 plastic water bottles every year, more than a third of which are not recycled but littered or dumped in landfill, generating 233,000 tonnes of CO2 equivalent emissions. Switching to reusable bottles would prevent 6,741 tonnes of plastic waste entering our natural environment each year. Cigarette butts are a particular problem because smokers do not regard them as litter and often throw them away in drains, which empty into rivers. In fact, say the researchers, 95% of cigarette filters contain cellulose acetate, a plastic which can take up to 12 years to degrade. But things can change. The report found that plastic bags account for only 1% of plastic waste found in rivers, demonstrating the effect of action taken by European nations to reduce usage. In the UK, a compulsory 5p per bag charge has cut the number of plastic bags issued by 86%. Although the public is now more aware of the scale of plastic pollution in the oceans, the report says fewer people realise that rivers are the major source of marine plastic pollution. 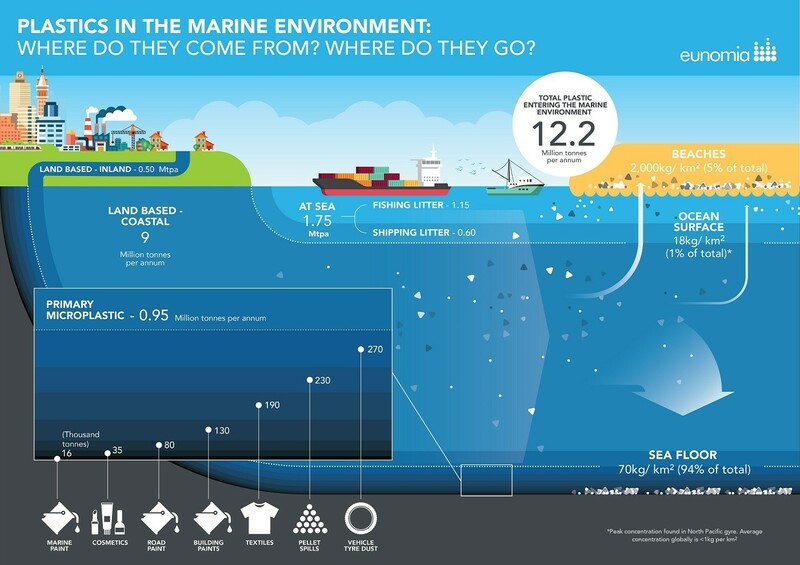 Scientists calculate that 90% of plastic in the world's oceans comes from just 10 rivers. Plastic in the oceans can take up to 500 years to degrade, according to a recent report. Earthwatch says many people want to change their buying habits to reduce plastic waste but are “faced with a bewildering array of ‘environmentally friendly’ products and suggestions”, many of which do not provide evidence to support their claims. Governments are taking action with the European Parliament voting earlier this year to ban certain single-use plastics, including drinking straws, plastic cutlery and plates together with cotton bud sticks by 2021. It set a target of recycling 90% of plastic bottles by 2025. The whitepaper, Harnessing the Fourth Industrial Revolution for the Circular Economy, released at this year’s World Economic Forum Annual Meeting in Davos, said that only 14% of the world’s plastic packaging is collected for recycling, and only 2% is recycled into a similar-quality product. In an earlier report, The New Plastics Economy - Rethinking the Future of Plastics, the Forum called for “a fundamental rethink for plastic packaging and plastics in general” setting a goal of a world where plastic leakage into the environment is halted.